Republican presidential candidate Donald Trump returned to the early voting state of New Hampshire Monday morning, where he said he would address what he considered the country's issues, including getting rid of Obamacare. Trump held a town hall in Atkinson, where the topics included investing in the country's military and overseas relations. "If I win, we're going to build the strongest military we've had in this country," Trump said. "Nobody is going to mess with us." 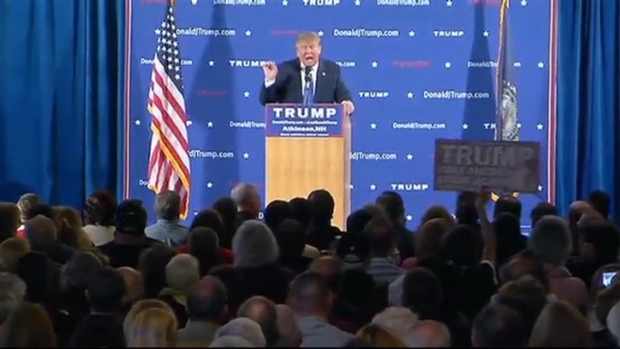 Trump also took aim at fellow candidates Ben Carson and Jeb Bush, saying Carson was even more low-energy than Bush. Trump spoke Monday morning in Atkinson, New Hampshire, on investing in the country's military and overseas relations. He also discussd what he said was the media's portrayal of his campaign, saying it never shows his "massive crowds." Trump ended his event saying that his crew would work on improving trade and commerce in the country. "We're going to fix trade. We're going to get rid of Obamacare. We're going to build up our military. We're going to take care of our vets," Trump said.